A PickFu pollster tested two potential wall-mounted bottle opener designs, drawing on an audience of 50 Amazon Prime members. The products differed both in price and in design. The first design (Option A), priced at $12.99, was a metal trapezoidal receptacle with an attached black bottle opener. No artwork adorned it save for the embossed brand name. The second design (Option B), priced at $24.99, was a wooden wall mount shaped like a bottle, with an attached silver metal receptacle and a retro-style joke about beer. 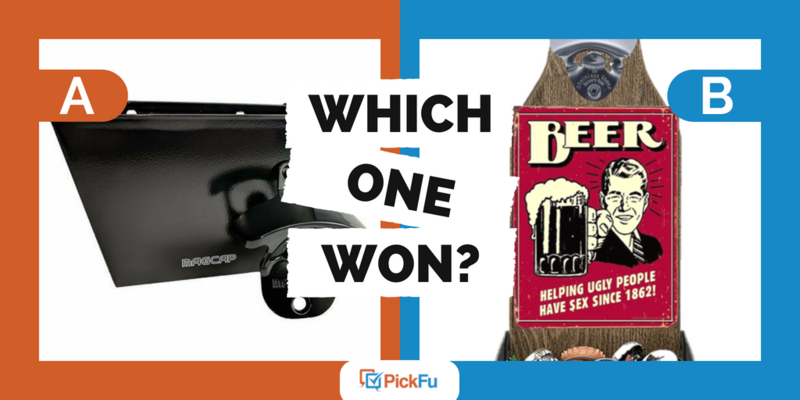 Can you guess which bottle opener the respondents chose? Check out the poll results here. Overwhelmingly, the respondents selected the less expensive plain black bottle opener design. 84% of respondents preferred Option A, with only 16% of respondents opting for the wooden bottle-shaped design. Analyzing the results of this poll, however, is difficult to do, because the pollster made the mistake of asking a double-barreled question. A double-barreled question tries to test two things at once (that is, a radically different design and a large price difference), thereby skewing the final poll results. Double-barreled questions make it difficult to tease out what factors drove the respondents’ choices. However, because PickFu solicits commentary from respondents in addition to their straight A or B vote, we can gain some insight into why respondents made the choices they did. 40% of respondents – about half of those who chose Option A – cited price as a significant factor in their choice. Interestingly, one respondent mistakenly believed that Option A was more expensive but still selected it over B, saying that it was “elegant and upscale” and that this justified a higher price. It’s clear that price factored into the popularity of Option A. However, 75% of those who mentioned price also mentioned other factors, usually assigning price a significant but secondary role in their decision. Did Anyone Like the Joke? Of the few respondents who chose the joke design, only one specifically cited the joke as a positive factor in her choice. Most respondents who chose Option B cited aesthetic reasons for their preference, saying that Option B was “more interesting” and could be used as a “decoration piece.” Interestingly, three people who chose Option A said they actually liked the joke, but those three individuals gave other reasons for rejecting the joke design in favor of Option A. 18% of all respondents had critical comments about the joke, calling it “inappropriate,” “dumb,” and “gaudy.” One respondent liked the joke but expressed unwillingness to have it in her house where her children would be exposed to it. Want to create your own polls and find out what people think of your product ideas or designs? Create a poll just like this one starting at $50. Stop guessing and start testing!